Self-assembly of ABC triblock terpolymer to patchy nanopartcles and crystallization into a diamond lattice. The controlled self-assembly of defined particle lattices with lattice constants in the range of 50-500nm remains challenging. There is a lack of proper nanoscale building blocks with sufficiently low size-dispersity and the required high resolution of directional interaction patterns as well as a limited understanding of self-assembly pathways and kinetics for the long-range ordering. The deformability and dynamic nature of polymer nanoparticles could be a key feature facilitating formation of defect-free lattices. 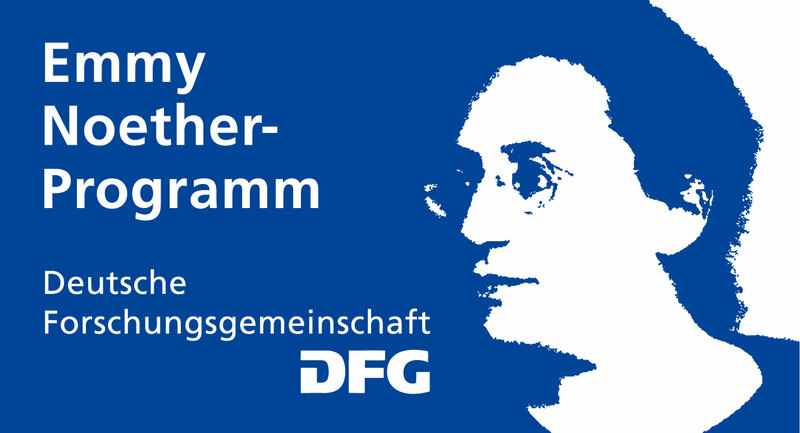 This Emmy Noether project seeks bringing together concepts of block copolymer synthesis, supramolecular self-assembly, and supracolloidal cluster formation to create open nanoparticle lattices with well-defined symmetry. Two main challenges are addressed: the predictive formation of polymer nanoparticles with geometric surface topography and their enhanced directional self-assembly into defined nanoparticle lattices. To approach these aims, we first synthesize ABC triblock terpolymers with suitable block copolymer compositions, which directly translate into the number of surface beads or patches. These patches are incompatible with the core and separated by corona chains, and arrange in geometric order. This order controls directionality of aggregation potentially leading to nanoparticle lattices with symmetry reflecting that of the patchy geometry. Photonic colors are found in a myriad of examples in nature (sea shells, bird feathers, Pollia fruit), where the most instructive example might be opals. Opals are natural gem stones of silica nanoparticles in the range of 200-400 nm displaying bright and vivid play of colors (valuable specimens are highly transparent). The regular alternation of refractive indices between air and silica causes modulation of visible light and reflection of specific colors. Since photonic colors are a result of the architecture they never fade unlike e.g. 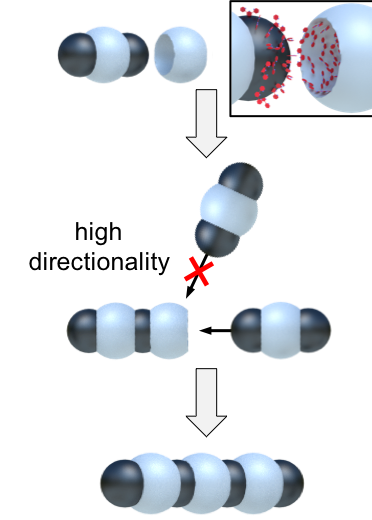 photo-bleaching observed for organic dyes (physical color vs. chemical color?). Block copolymers have recently also demonstrated the ability to generate structural colors through morphologies with structural periodicities on the order of the wave length of visible light (usually lamella morphologies). In order to reach lattice parameters of 200-300 nm either very large molecular weights are required to fill the space or special voluminous polymer architectures (e.g. polymer brushes have been successful). To compensate the relatively narrow window of refractive indices of polymers (typically n = 1.3-1.7), inorganic materials may be mineralized in selected domains to enhance the optical contrast difference (brighter play of colors). In the article "Block Copolymer Micelles for Photonic Fluids and Crystals", we describe the precision assembly of block copolymers to spherical block copolymer micelles (BCMs) with super-stretched corona, yet with very narrow size-distribution to qualify as building blocks for tuneable and reversible formation of photonic fluids (MPFs) and photonic crystals (MPCs). The BCMs first show slight bluish hues in concentrated gels (4wt.-%) with interparticle distances of around 150nm as defined by the electrosteric repulsion from the highly charged and stretched corona. Upon dilution (<2wt.-%), particle concentration is reduced and free-flowing fluids now consist of BCMs with an average interparticle spacing of 150−300 nm accompanied with a color change to green and red. The increased particle mobility allows for structural rearrangements and the formation of millimeter-sized free-floating MPCs with classical FCC lattice grow in the photonic fluid-medium upon refinement of the positional order of the BCMs. We discuss the generic properties of MPCs with special emphasis on surprisingly narrow reflected wavelengths with full width at half-maximum (fwhm) as small as 1 nm. We expect this concept to open a generic and facile way for self-assembled tunable micellar photonic structures. This work was a collaboration with the Molecular Materials group in Aalto Finland and the Bio-inspired Photonics group in Cambridge, UK. The observed scattering intensities gave some inexplicable discrepancies between simulation and experiments, which are under current investigation. Another open question relates to the reversible crystallization into extensive lattices at very low particle concentrations of 0.02 wt%, despite the purely repulsive nature of the corona. We will address these questions in ongoing studies and expand the field to other core shapes and core materials. Specially designed ABC triblock terpolymers will allow the synthesis of polymer nanoparticles with complementary accessible topography, i.e. surface beads (key nanoparticle) and core cavities (lock nanoparticles). The location of beads/cavities determines the geometry of the nanoparticles and should control the symmetry of the formed nanoparticle lattices. Lock and key configurations do not assemble with themselves but exclusively with each other. This shape complementarity will ensure highest directionality. We will quantify particle geometry with advanced analytical tools such as cryogenic transmission electron tomography. To improve our understanding of nanoparticle interaction, assembly kinetics will be followed online with liquid cell TEM, an emerging technique to monitor processes in-operando. Synthesis and understanding will be combined to approach the goal of self-assembling the diamond cubic lattice for photonic application. Nanoparticles with core cavities are suited for lock & key co-assembly with size-matching nanoparticles of other sources (organic, inorganic, biological) for increased complexity and functionality. The number of surface beads/cavities on/in the A core is controlled by the weight ratio of the core blocks, fA/fB. This allows the preparation of a series of polymer nanoparticles encoded with molecule-like geometry, i.e., linear, trigonal planar, tetrahedral, trigonal bipyramidal, and so on. The symmetric arrangement of beads/cavities will later define the lattice symmetry. The optimum value for fA/fB will be screened synthetically on a series of model ABC triblock terpolymers, which will be greatly facilitated a novel synthetic route developed in the Gröschel group. It will be interesting to study the crystallization behavior of each individual nanoparticle configuration individually, e.g. 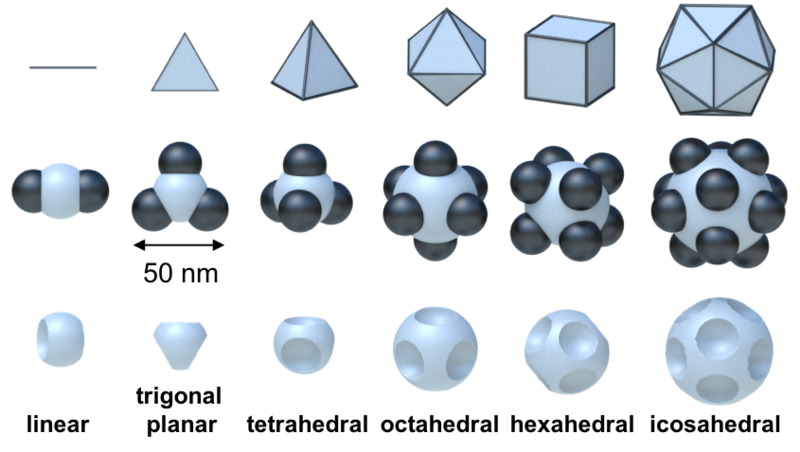 lattice formation of nanoparticles with trigonal planar or octahedral symmetry. However, the final goal will be to establish libraries of co-crystals of nanoparticle mixtures. Considering that lock and key nanoparticles can be co-assembled in various mixing ratios, as different geometries, with more then two configurations, and other nanoparticles (e.g. gold nanoparticles, proteins etc.) this concept will pave the way to a seemingly endless number of functional nanomaterials.